Home / Resources / Knowledge Center / What are Industrial Shredders? Many companies struggle with the disposal of oversized waste piles. Where to take it, how to dispose of it, how to become more eco-friendly? In recent years, many businesses have invested in industrial shredders to solve many of these problems. But really, what is an industrial shredder and why do you need one? Industrial Shredders are high-powered machines used to cut through and destroy the toughest debris in all types of environments. Buyer beware though – not all waste is created equal and should not be treated the same. The size, shape and material composition can have a significant impacts on the ideal grinder or shredder that is chosen in your facility. Hopper fed shredders, which shear (uses a scissor-type motion to cut through solids) are ideal for industrial environments. The Hopper Fed SHRED Series are industrial shredders that can handle a variety of different materials and shred them down to size. These shredders are customizable to ensure they can meet the needs for a variety of applications. Whether you need particle size reduction, product destruction, feedstock preconditioning, these shredders can be customized to meet your applications exacting needs! JWC offers the 1-SHRED, the 3-SHRED & 4-SHRED and the 7-SHRED. So no matter what throughput or torque you require we have a shredder to meet your needs. The SHRED Series waste grinders are responsible for quickly cutting various problem solids down to size. When operating an industrial shredder, the material is placed into the hopper, which feeds the material down to the shredder’s two rows of sharp, steel cutters that are slowly rotating. The cutters grab the material and then pull the material through to turn the large solids into small pieces. The 3-SHRED application is a medium-sized shredder. These waste grinders are designed to easily cut through debris that typically causes problems such as wood, glass, fish processing waste, food waste and much more. The 4-SHRED-1 & 7-SHRED-1 are designed for some of the most difficult grinding jobs in industrial environments. A wide variety of materials from food waste to plastic to clothing to bricks and ceramic tile are easily ground up with these tough shredders. The strong shafts and heavy duty seals can quickly shred items down to size. This size reduction equipment has been successful in numerous applications including shredding for recycling, preconditioning of organics for waste-to-energy operations, hazardous waste disposal, seafood processing and destruction of off-specification or contraband products, just to name a few. The two shafts of sharp steel cutter teeth are rotated at different speeds creating a scissor-like cutting motion and focuses on slicing waste into small particles, this ensures that the waste is consistently chopped-up to appropriate sizes. The waste is dropped into the cutters and within seconds, the waste is processed and destroyed. When cutter shafts are programmed at low speeds, less shock is created, making this a top speed for grinding difficult objects. The motor’s peak torque can be delivered to the cutters in a more controlled and efficient manner as opposed to high-speed systems. Industrial shredder cutters are available in a variety of sizes – the 3, 7, 11, 13, and 23 tooth options. The thickness of the cutters and the number of teeth within the grinder will alter the particle sizes. All cutters are available in stainless steel to allow for exposure in harsher environments. The ability to replace cutters without sending the whole grinder in for maintenance or calling a maintenance team to service the grinder saves time and money for all parties involved. The individual cutter was designed for swapping out cutters easily and efficiently. Simply lift the shaft of the grinder and replace the cutters! This lowers the maintenance of the grinder, allows for easy replacement of cutters and creates a faster turn around time to get the grinder back up and running. A variety of motors are offered for the SHRED Series grinders to ensure the system meets your applications needs. Totally enclosed fan cooled electric (TEFC). XPFC: Explosion-proof fan cooled electric. Or, plug into an on-board hydraulic system using JWC’s control valve. Gear-reducers, also known as speed reducers, are a component of many mechanical, electrical, and hydraulic motors. Reducers are used to change the speed of the drive shaft. Through use of different reducer ratios, the drive shaft speed can be adjusted to either provide more torque or to adjust throughput of industrial shredders. If you need to grind a very tough material that needs a lot of torque, you can select different horsepower motors, and/or change the gear reducer to achieve the torque you need. If you need higher throughput, then the reducer could be adjusted to increase the speed the cutters rotate. 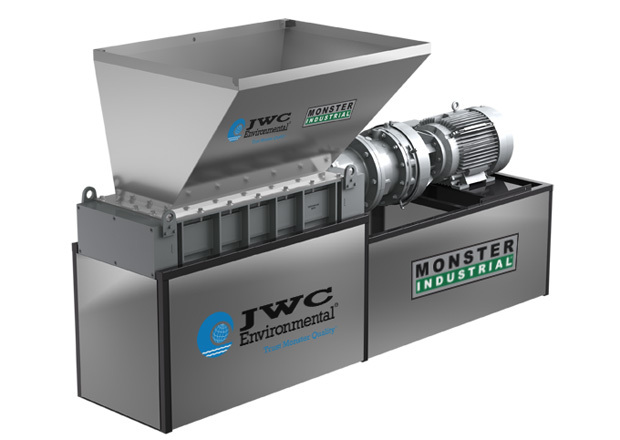 All JWC shredders have reducers as all our industrial shredders rotate at a very slow speed. How do industrial shredders work? Based on the throughput, cutter force and particle size that your industry is trying to achieve, there is a shredder that will accomplish your goal. Our shredders’ throughput range is from 40 ft3/hr to 1500 ft3/hr. The cutting force will be determined by the type of solid and strength of the material that is being shredded. We often recommend to test the material being shredded to ensure that the industrial shredder is specified to meet the precise needs of your application. Our motor sizes range from 5 hp to 100 hp. Why are Industrial Shredders used? The main usage for industrial shredders is the ability to reduce the size of waste that is being destroyed and protect pumps and equipment from damage. With so many harsh products being destroyed, it is necessary to start protecting your equipment before it is too late. Industrials shredders can shred debris large or small, hard or soft. Once the debris or waste has been shredded, there are various options for the remains. In many instances the remains are recycled and used for feedstock preconditioning for digesters, composting or event manufactured into different products. With the increase in hauling and landfill fees, many companies have converted to grinding! What Industries Use Industrial Shredders? Industrial Shredders are working every day protecting pumps, destroying debris or just making things work better. They are found in applications like recycling, waste to energy, commercial facility sewage, food processing, and oil & gas – just to name a few. JWC grinders have been installed in various types of environments. CLICK HERE to read about how the 3-SHRED grinder uses two rows of sharp steel cutters to grab material and pull it into the grinder for size reduction.